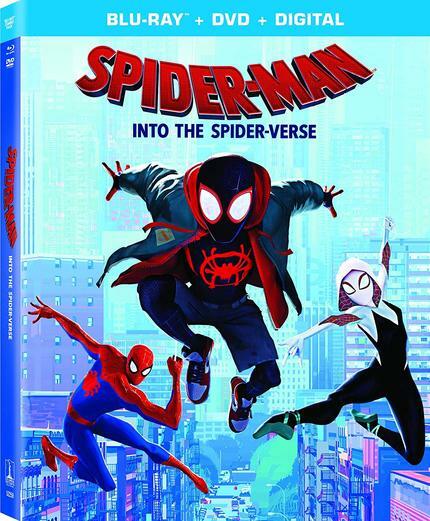 After an incredibly successful theatrical run, almost unanimous critical praise, and an Academy Award for Best Animated Film, Bob Persichetti, Peter Ramsey, and Rodney Rothman's Spider-Man: Into the Spider-Verse swings onto home video in a stacked edition from Sony Pictures Home Entertainment. The film follows the birth of a new superhero is mild-mannered Miles Morales, a young Afro-Latino who is bitten by a radioactive spider in a an alternate universe from the one we've seen so many times on the big screen. The thing that separates this Spider-Man from all previous incarnations is the introduction of the Spider-Verse concept, an infinite number of parallel universes, many with their own Spider her, colliding following a science experiment gone crazy. In order to save his own world, Morales must team up with Spider-Noir, and alternate Peter Parker, Spider-Gwen, and Spider-Ham against Doc Ock and Kingpin. It is nuts in the best possible way. Spider-Man: Into the Spider-Verse is an unusual and unusually charming coming of age story in the guise of a superhero film. I didn't think I wanted or needed this film, to be honest, but what the filmmakers managed to make of the final product proved me wrong. This is perhaps the most emotionally sophisticated and empathetic treatment of one of comics' most human of characters, and for that alone it is worth giving a try, even if you've grown as fatigued by this particular brand of spectacle as I have. Miles Morales might be the best big screen Spider-Man yet, he's certainly the freshest, and after having had eight chances to get it really right, that's saying something. Having now rewatched the film a couple of times since then, I stand by everything. This may very well be the best Spider-Man film yet. I've grown accustomed to Blu-ray releases of new movies doing the bare minimum in terms of supplementary materials, but thankfully Sony Pictures goes all out for the 'Verse. On top of stellar audio and visual presentations - though strangely no 3D options on North American home video that I can see (try Germany or Italy if you're looking for those) - the disc also packs in a decent number of extras that help to contextualize the film and the crazy concepts within. We get a really cool "alternate universe mode" where the film is recut and re-edited to include a virtual tour by the filmmakers of the process as well as storyboard art and much more. There's an audio commentary with the directors alongside producers Lord & Miller that elucidates some of the production process as well. We also get featurettes on representation in the film, each of the individual Spider-People, one that points out some of the hundreds of Easter Eggs in the film, lyric videos for the two big singles from the film, as well as very fascinating looks at the revolutionary animation process used in the movie. As if all that weren't enough, there is also a heartfelt tribute to Spider-Man creators Stan Lee and Steve Ditko, and a neat little Spider-Ham short film that helps connect the character to the events of the film. If there was nothing more on this disc than the film, I'd recommend it in a heartbeat, but with Spider-Man: Into the Spider-Verse, Sony Pictures has delivered a package worthy of the film. Highly Recommended! Review: SPIDER-MAN: INTO THE SPIDER-VERSE, Once More With Feeling!